Blackjack is played all over the world as it is one of the most exciting casino games. One of the most popular destinations for gambling is Atlantic City as it offers players the chance to play in a number of world-class casinos. Whether they plan to go on a one-day trip or have one week holiday, they will surely experience a high level of entertainment and excitement like never before. This world-famous resort offers one very interesting version of blackjack – Atlantic City Blackjack. The game was named after this particular city as it was played for the first time in casinos, located in this area. It is undoubtedly a very widespread version as it has proven to be just as exciting and challenging as the classic game. In this resort city, if a particular casino wants to change any of the rules, this request has to be approved by the New Jersey Casino Control Commission. Thus, many casinos prefer to use the same basic rules when it comes to this variation of blackjack as it is much more complicated to alter them. The basic rules of Atlantic City Blackjack are the same as the standard game. Players compete against a dealer who represents the respective casino. Their main goal is to form a hand whose total is as close to 21 as possible and beat the dealer. In case they surpass this number, they bust and lose the game. Atlantic City Blackjack is played with eight decks, instead of the usual four packs of cards. At the beginning of the game, the dealer has two cards – one face up and one face down. It is a hole card game, meaning that the dealer peeks for blackjack. For instance, if he holds an Ace or a 10-valued card, he will check his other card. In case that he has indeed blackjack, players lose their bets and the game is over. In general, hole card games are more beneficial as they prevent players from losing more money due to the fact that they won’t place any large bets when the dealer is bound to win. In this variation, after players receive their first two cards, they are allowed to double down on any two cards and also, they can do so after splitting. It is possible to split a pair up to three times and make a total of four hands. Any 10-valued cards, regardless of their suit, can be also split. However, there is one exception, when it comes to Aces as they can be split only once. In case that players happen to split a pair of Aces, they are dealt only one card. It should be also noted that if they split an Ace and then get a 10-valued card, this combination is considered to be 21 instead of blackjack. The dealer is enforced by the rules to stand on soft 17 and the payout for blackjack is either 3/2 or 6/5, depending on the respective casino. Any other winning combinations pay out even money, just like the classic blackjack. Insurance is also another option that is available in this version and it can be placed only if the dealer has an Ace. In most cases, this side bet pays out 2/1. It is possible to play either a single-hand or a multi-hand Atlantic City Blackjack. What sets Atlantic City Blackjack apart from the classic game, is the fact that late surrender is allowed in this variation. Late surrender offers players the opportunity to withdraw from their current hand after the dealer has checked for blackjack. In such cases, they lose half of their initial wager and retain the other half, without playing their hand. However, it is worth noting that if the dealer has a natural blackjack, players cannot surrender and as a result, their original wager will be completely lost. A number of casinos in Atlantic City offer this move, however it is not always displayed in the most visible place as it has proven to be beneficial for the players. In general, late surrender is not as favorable as early surrender as it doesn’t decrease the house edge as much. However, if players know when exactly this move should be used, it can be very beneficial for them. In order to clarify the usage of late surrender better, let’s have a look at some of the situations in which it is best to take advantage of it. For instance, if players’ hand totals 15 or 16 and the up card of the dealer is a 9,10 or 11, it is a good idea to surrender. The same goes for the cases when players have a total of 17 in their hand and the dealer has an Ace. If players are dealt a pair of Aces, it is advisable to always split them as this way they will form two strong hands. In contrast to a pair of Aces, when they get a pair of 10’s, it is best to stand, regardless of the up card of the dealer. When it comes to late surrender, even though this move can be very beneficial in some cases, it is important to make it only when it is indeed needed. Insurance is another available option, however in most cases placing this side bet works in favor of the casino. It has house edge that is around 8% which makes it highly unfavorable. However, it can be a very good option for card counters, providing that they are able to determine the ratio of the high value cards to low value ones. In general, it is always a good idea to follow a basic strategy and adhere to it throughout the whole game. The same rule applies when playing Atlantic City Blackjack. In order to win and make the most of every game, players should always prepare themselves in advance and get familiar with the basic rules. It is also essential to have a money management system as without it, they won’t be able to retain their winnings. Due to the fact that throughout the years Atlantic City Blackjack has gained in popularity significantly, nowadays it is possible to play this variation online. Thanks to one of the most prominent software providers Microgaming, players from all over the world have the chance to experience this exciting variation at the comfort of their home. A number of online casinos have teamed up with this software company in an attempt to provide only top-quality games. There is no need to travel all the way to a land-based casino in order to enjoy this variation which is undoubtedly a great benefit. The online version has a very realistic design and exclusive features which assure high level of entertainment. Moreover, some online casinos also offer a live dealer Atlantic City Blackjack which gives players the chance to experience the game as if they were in a brick and mortar casino. The action of the game unfolds before players’ eyes as it is possible to see the dealing of the cards in real time thanks to the live streaming video. This version is no longer exclusive to Atlantic City players as presently, it can be found in every reputable online casino. 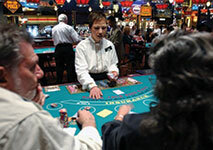 Atlantic City Blackjack is one of the most popular variations that is played by a number of players. Its basic rules are the same as the classic game, however it has its subtleties and exclusive features which make it very entertaining and challenging. The game can be easily found in every brick and mortar casino in Atlantic City as well as online and it is entirely up to the players to decide the most convenient for them way of playing.